The aircraft carrier USS Hornet heads through the heavy swell of the Pacific in April 1942. A short time later B-25’s of the legendary Doolittle Raiders will launch from the Leaving deck of this mighty ship - destination Tokyo! The companion print to OUT OF THE DRAGONS DEN - not available individually. 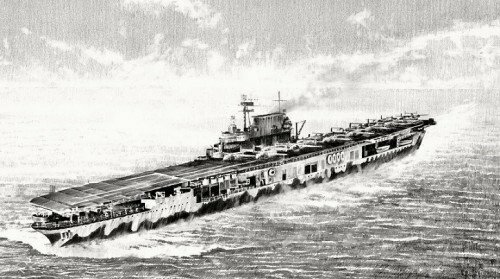 Each print is personally signed by a veteran of the USS Hornet that was involved in the Doolittle Raid.